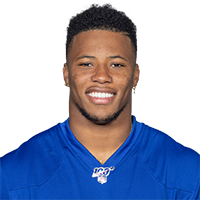 Published: Dec. 30, 2018 at 03:10 p.m.
New York Giants running back Saquon Barkley's 68-yard run makes him the third rookie running back ever with 2,000 total yards in a season, joining Eric Dickerson and Edgerrin James. Published: Dec. 30, 2018 at 01:10 p.m. Published: Dec. 23, 2018 at 01:21 p.m.
New York Giants running back Saquon Barkley rushes for a 1-yard touchdown.